Perfect fit or your money back! How many times did you buy an allegedly “one size fits all” product just to see it does not fit at all? To avoid that we designed two different sizes and a special interior shape that fits the human head better. You get an incredible deal! Why? Headsets of similar quality, design and material sell between $80 and $250. Due to special deals with our suppliers and our low marketing budget we dropped the price so anyone can enjoy top-notch quality and increased safety. Customers say our helmet is better than the popular top brands. We believe so too and we offer you the chance of a RISK-FREE purchase due to our iron-clad guarantees and 1 YEAR WARRANTY. CUTTING-EDGE INTELLIGENT DESIGN – Discover a high quality helmet that looks and feels great on your head. Subtle and elegant, it’s large enough to protect you but slim enough to look good. The high quality materials and the Matte Finish give it a stylish look you’ll never find in shiny cheap helmets. Enjoy the OVAL SHAPED design and you’ll never want to go back to the round and uncomfortable helmets again. 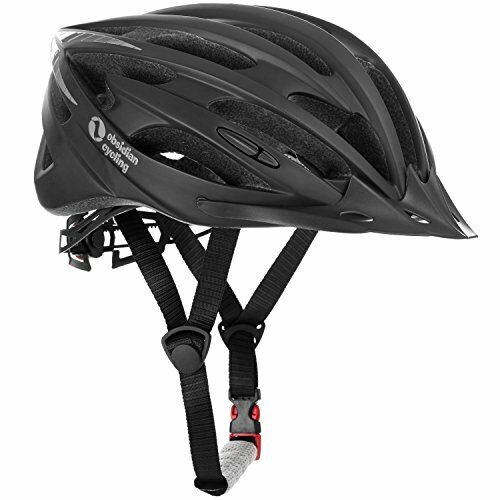 SOLID EPS SAFETY LAYER – TOP NOTCH SAFETY FEATURES – CE certified, the Obsidian Team helmet meets rigorous safety standards and can successfully protect your head from powerful shocks. It’s made of high quality EPS molded through the “in-mould” technology used by ALL high quality and actually safe helmets. Invest in your safety and well-being and wear a REAL helmet. BREAKING NEW PATENTED ADJUSTMENT SYSTEM – Easily adjusts vertically AND horizontally for a tighter and snugger fit. Your head shape is unique and this innovative system allows you to adjust the helmet to fit perfectly. This advanced system is 80% of the reason this helmet is so comfortable. Moreover, this pioneering strap design accommodates PONYTAILS. Trust us, once you try it, you’ll wonder how you lived without it. EXCELLENT VENTILATION, directly influenced by the size of the air vents located on the front, which allow air to pass through easily. We designed 22 very efficient wide frontal air vents that do the work of 30 standard vents and provide excellent AIRFLOW from the front to the back. Now you can comfortably ride even in the sun, on a hot day. A HELMET THAT ACTUALLY FITS & 100% SATISFACTION GUARANTEE – One size fits all promises usually end up being just promises. That’s why we offer two sizes: S/M and M/L. Still worried if it will fit nicely? Don’t be, we also offer a PERFECT FIT GUARANTEE. And if you don’t absolutely LOOOVE your new helmet you can take advantage of our satisfaction guarantee or 1 YEAR WARRANTY and get your money back. Take advantage of this RISK-FREE PURCHASE and invest in your safety…and your looks.